One of the nice things about having multiple card manufacturers for over most of the past 30 years is that occasionally one of them would issue a card of a Phillie that none of the other sets captured. For example, Fleer was the only company in 1981 to issue a John Vukovich card. If you prefer a more recent example, the 2010 Upper Deck set will be the only place you will ever find a card depicting Jack Traschner as a Phillie. In fact, even though the Phillies both issue and update their own team sets every year and sometimes work with manufacturers to have special giveaways at the end of the season where a special team set is issued just to fans attending one particular game (see the 2007 Upper Deck/Majestic Phillies Alumni Team set, which annoyingly goes the extra step of having Legends inserts — of which I’m still missing three), there are plenty of Phillies through the years that never see themselves grace a baseball card in a Phillies uniform. Sadly, the monopoly that MLB granted to Topps starting last year only means that such a thing is more likely to happen than over the past 30 years. Topps has never had a great history of capturing all the players who rightfully deserve their day on a Phillies card. In 1968 Roberta Pena played in 138 games as the Phillies starting shortstop — no card for him. Last year, Juan Castro appeared in 54 games for the Phils, but you’ll only find him in the two Phillies team issues. Even more puzzling are the cards of players who have cards depicting them as members of the Phillies even though they never actually appeared in a game for the club. But, more on that another day. 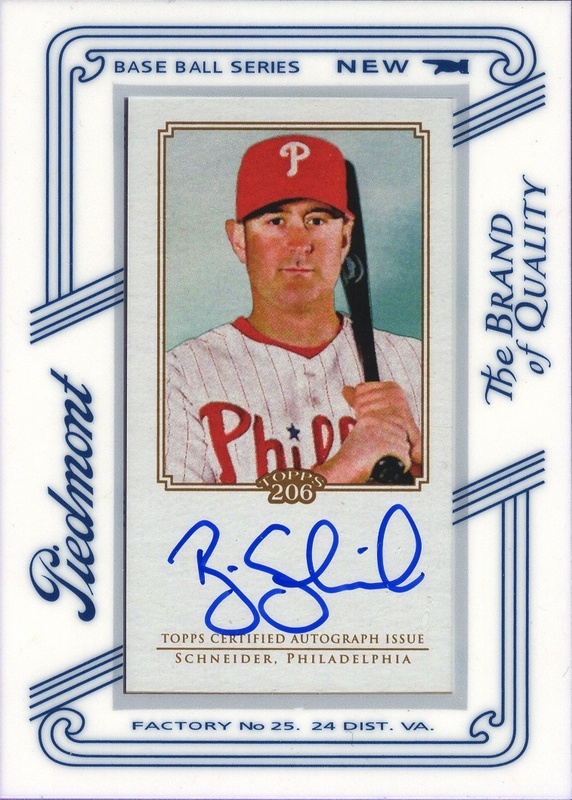 So in honor of those Phillies who never quite got the recognition they deserved from Topps (or any of the other manufacturers when they had the license to do so), here’s the 2010 Topps 206 Mini Framed Autographs Piedmont Insert, Brian Schneider #BS. It’s his only appearance on a Topps card last year, and it’s an autograph insert to boot. You would think that if Topps went through the trouble of making such an insert that they would include Schneider somewhere in one of their many other sets, but no. Unless you picked up one of the two Phillies team issues last year, this was the only way you could find him. But at least he got one, which is more than can be said for Castro, Ross Gload, Mike Sweeney, Nelson Figeuroa or Denys Baez — none of whom appeared last year on a Phillies card issued by Topps.